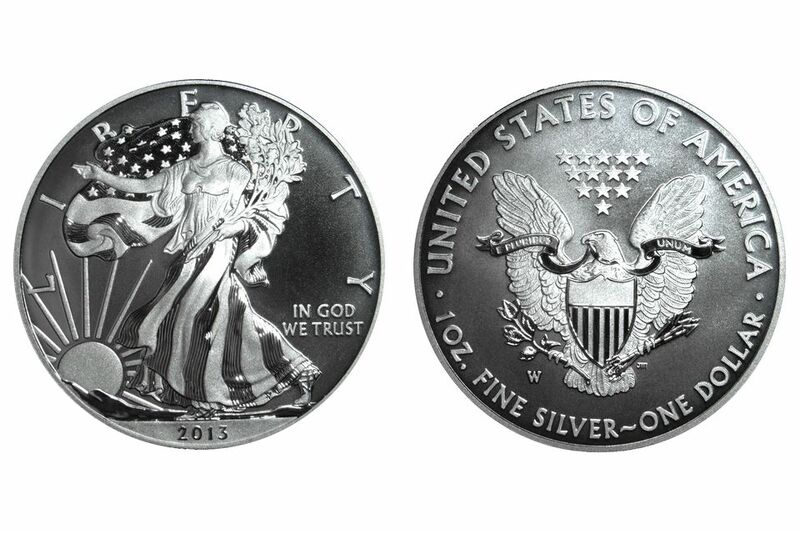 The 2013-W American Silver Eagle Enhanced Uncirculated bullion coin was the first coin produced by the United States Mint that uses three different contrasting finishes: mirrored brilliant, light frosted and heavy frosted. The new light frosted finish is a soft satin finish used on the field of the coin to gently disperse light that is reflected off of it. On the obverse, the mountains in front of the sun, the lines on Lady Liberty's dress and the red and blue parts of the United States flag have a brilliant mirrored finish. The remaining devices and lettering on the obverse have the standard heavy frosted finish. On the reverse, the ribbon in the eagle's beak, the arrows and oak branch all have a brilliant mirrored finish. The lettering and other devices on the reverse have the heavy frosted finish. The fields on both sides of the coin have the new light frosted finish. Each coin was struck with specially prepared dies at the West Point Mint facility. In order to bring out the three contrasting finishes, each coin was struck three times on burnished 99.9% silver planchets. Each planchet was hand fed into the coining press and inspected by the operator before it was sent on to be encapsulated and packaged. The popularity of the 2013-W American Silver Eagle with the enhanced uncirculated finish proved to be very popular. The United States Mint sold a total of 281,310 coins. In 2014 the mint produced to coins with the enhanced uncirculated finish: 2014-D Native American dollar and the 2014-S Kennedy 90% silver half-dollar available only in the 50th Anniversary of the Kennedy Half-Dollar set. The Mint continued the tradition of issuing an enhanced uncirculated coin in 2015 with a special set featuring the 2015-W Native American dollar honoring the Mohawk High Ironworkers. The United States Mint celebrated its 225th anniversary in 2017 with a special enhanced uncirculated set. The set included each of the circulating coins (penny, nickel, dime, five America the Beautiful quarters, half dollar, and Native American dollar) packaged in a commemorative holder. Obverse Description Lady Liberty walking toward the sun, her right arm outstretched, her left arm carrying a bundle of branches, and with a flowing cape with stars on it. LIBERTY is above, IN GOD WE TRUST is to the lower right, and the date is below. Reverse Description Heraldic Eagle with Shield, symbolizing strength and endurance. Inscriptions: UNITED STATES OF AMERICA, 1 OZ. FINE SILVER ~ ONE DOLLAR, and E PLURIBUS UNUM on ribbon in eagle's beak. Notes First coin produced with special "light frost" finish. The 2013 American Silver Eagle Enhanced Uncirculated version was minted as indicated in the following table. The table lists the years, strike type, the mint facility where made, the mint mark used on the coin and a description of any type differences in coins minted for that year. The following are popular errors and varieties that Silver Eagle collectors look for. These coins usually carry a premium and are valued above a common coin. The following table lists mint production figures for the 2013 American Silver Eagle Enhanced Uncirculated version that were produced at each mint facility. Where possible, production numbers by strike type are noted.